Heat oven to 350°F. Line 13x9-inch pan with foil, letting foil hang 2 inches over sides of pan. Spray foil with cooking spray. Make brownie batter as directed on box. Spread in pan. Bake 22 to 25 minutes or until toothpick inserted 2 inches from side of pan comes out clean. Transfer to cooling rack to cool completely in pan, about 1 hour. Freeze in pan 30 minutes. Using foil to lift, remove brownies from pan, and peel foil away. Cut out 9 gingerbread men using 3-inch gingerbread man cookie cutter. Gently push brownie out of cutter each time. Set aside end pieces for snacking. If cutter gets sticky, wipe clean with damp paper towel before cutting again. 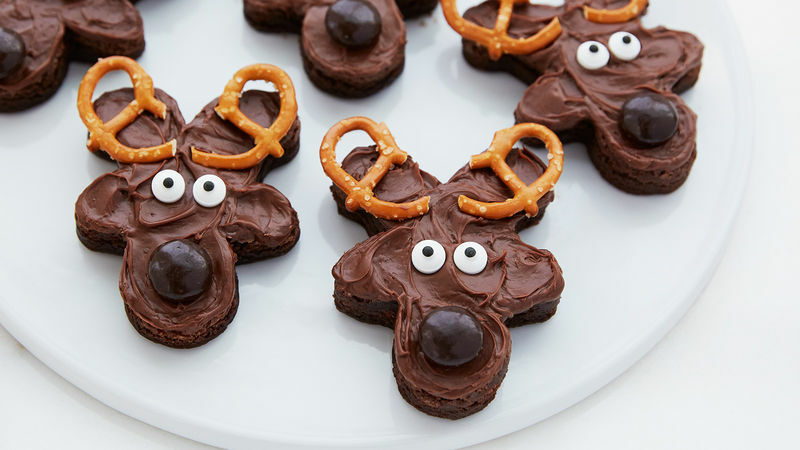 For each brownie, turn so head is pointed down to look like reindeer face. Using knife, spread heaping tablespoon frosting over top of brownie. Attach halved pretzel twists for antlers, 2 candy eyeballs for eyes, 1 Junior Mint™ candy for nose. To easily line the bottom of the pan, tip upside down and form foil around bottom and sides. Flip pan over, and place foil insert inside pan for a perfect fit! For a creative change, try vanilla frosting instead of chocolate on some or all! Try extra brownie pieces as a delicious topping for ice cream.